WARMEST SO FAR: As expected, temperatures are in the mid 80s across most of Alabama this afternoon, and for most every community today is the warmest day so far in 2019. The weather won’t change much on Thursday — dry, very warm and partly sunny. The high will be back in the 82- to 85-degree range. It will be breezy Thursday, with a south wind averaging 10-20 mph. TO THE NORTHWEST OF ALABAMA: Heavy, wet snow will continue through tonight in Wyoming and South Dakota and will expand across Nebraska, Minnesota and Wisconsin on Thursday. Very heavy snow and strong winds will create blizzard conditions, and travel will be severely disrupted, becoming impossible at times. 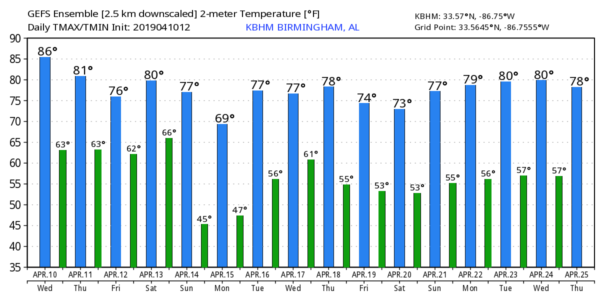 THURSDAY NIGHT/FRIDAY: Clouds will increase in Alabama Thursday night, and a cold front will bring a chance of showers, and possibly a thunderstorm or two, to the state Friday. The front will have little upper support, and moisture will be fairly limited, so rain amounts should be fairly light (less than one-half inch). The high Friday will be in the mid to upper 70s. ACTIVE WEATHER THIS WEEKEND: A potent weather system will bring unsettled weather to Alabama this weekend. Friday’s front will lift northward, and rain is possible Friday night into early Saturday morning. But new guidance continues to suggest that most of the day Saturday will be warm and dry with a mix of sun and clouds. We can’t totally rule out a shower or storm somewhere during the afternoon and evening as the air becomes unstable, but they should be widely spaced. The main window for heavier thunderstorms across Alabama will come from around midnight Saturday night through 3 p.m. Sunday. The threat begins in west Alabama late Saturday night, then gradually shifts into east Alabama Sunday morning. The Storm Prediction Center has most of Alabama in a severe weather risk during the time, and it continues to look like all modes of severe weather will be possible — large hail, damaging winds and a few tornadoes. It is important to note that this event is still four to five days out, and there is still considerable uncertainty concerning small-scale features, making it difficult to determine the magnitude, timing and placement of the threat. Expect forecast changes as we get closer to the weekend, but one way or another now is a good time to review your family severe weather plan. And every church and house of worship needs to be sure it can hear tornado warnings (having a NOAA Weather Radio) and has a good plan to get people into safe places in the event the church is in a tornado warning polygon. NEXT WEEK: Monday and Tuesday will be dry with cool mornings and pleasant afternoons (lows in the 40s and highs in the 70s). Another strong system could bring another severe weather setup to the state by Wednesday night and Thursday, but we need to get through the weekend system before we can focus on this one.